Here I am yet again not updating my blog consistently. I constantly take pictures for blog posts and then never actually write them. Over the next couple days I am going to try my best "not" to update my blog (and maybe that will better result in me actually updating it). It's a Jedi mind trick that may just work. Eric and I have been keeping busy. We are in the process of buying our first home in a very quick fashion, so much of our time has been devoted to getting documents ready and other such stuff. We have also had a lot of visitors on the weekends (pictures to come). I always love getting to check out something new when I go out with family and friends. 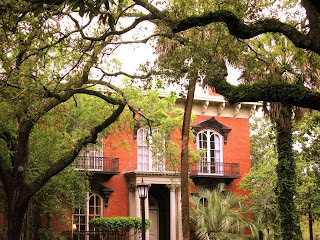 Recently, I have gotten to check out: Tybee Island Light Station and Museum, Carey Hilliard's Restaurant, Alex Raskin's Antiques, and The Tea Room, Savannah. Next time someone comes to town I am going to finagle them into touring the Mercer-Williams house with me! Downtown Savannah is looking SO pretty this time of year!